So, as we talked about last time, I have this crossbite issue. It’s affecting my top back two molars on the left side of my face. They’re basically off by 2MM, which seems super insignificant, but it affects the way my teeth align and therefore, throws off my whole bite. For those of you who don’t have a crossbite, it feels as though my teeth don’t “fit” into the grooves when I close my jaw together, so if I bit down REALLY hard, I have this weird sensation that I could crack a tooth (I’m sure I wouldn’t but it feels that way because just the tops of my teeth are touching, sort of). 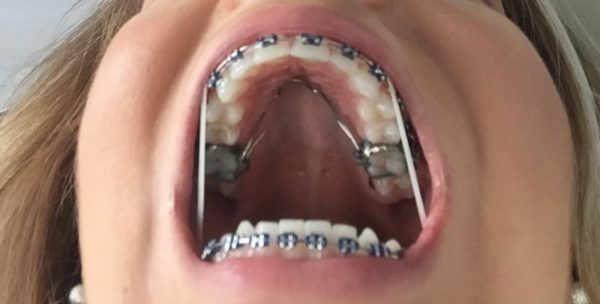 Back in late August, my new orthodontist tried using something called a ‘Goshgarian Wire’ to put pressure on those two molars to push them out. He warned me this may not be enough pressure since I’m an adult and the bone/palate is already fused solid, but it was a lot more comfortable an option. This is the Goshgarian Wire after I had it ‘installed’ a few weeks ago. After a month of wearing the wire, we decided the movement wasn’t happening nearly fast enough. I’ll be honest, as awkward as it looks, I had 0 pain from it whatsoever. So about two weeks ago at my most recent appointment, we took full impressions of my mouth and sent it off to the lab to discuss possible options for me. Right now, I have no idea what sort of contraption is going to be put in my mouth at my follow-up appointment next week. The ortho talked about a possible full-palate expander with a turn-key (like a lot of people have when they’re ~5 years old), but the issue with those is because I’m “so old,” the bone is solid and it is very hard to move things once it’s solidified. Palate expanders work very well on kids because their palettes are still very soft. The lab technician said he may have some other ideas once he received my impressions and would work something out with the ortho ASAP. I am totally excited for my surprise appliance appointment. CAN’T WAIT. …jk. I have been talking about rubber bands for effing months here. I’ve been wearing medium-strength “Gorilla” rubber bands for approximately six weeks now and they don’t bother me at all. I kind of love them because they’ve been helping create the smile I was hoping to see by wearing braces. They’ve been pulling my top teeth back in, and pushing my bottom teeth out (therefore closing up the gap and slight overbite created when straightening out my crowding). The elastics also seem to be widening my smile. For awhile, I felt like I was looking like a rat with inward facing teeth from my incisors-back. But the elastics seem to be spreading them out. It’s hard to explain. Hopefully, you can see a difference and understand what I’m saying. I wear them all day and all night, except for when I’m eating. I keep a bag in my purse and a bag in my bathroom at home. I can even put them on without a mirror. It’s quite fun. Minus the appliances to fix the crossbite and the rubber bands, I haven’t had much change. I have the same strength stainless steel wires on both top and bottom and it hasn’t changed since last time I posted. The only thing that HAS changed is that there are wire ties on both top and bottom instead of a power chain, which are helping ensure my teeth are moving as one, as the rubber bands do their ‘thing.’ For instance, if I didn’t have the wire ties on behind the brackets, the teeth on the bottom would be moving forward and getting REALLY tight because they’d be squishing together, ya know? With the wire ties, it makes them move forward *as one* and leaves enough room between them so I don’t have my original tightness/crowding problem when flossing. …BTW, flossing is REALLY hard with wire ties on top and bottom. You really need the threaders I mentioned back in this post. Even with those, it’s a pain. I can see why some people choose a Waterpik. But, with a little patience, it’s doable. This is where you can see more so where and what a cross bite is. See the back two molars on (your) right (AKA: the right side of this image)? Those teeth need to be pushed outward 2MM. That’s what is holding up my entire LIFE in braces. Oh, yea, we also drilled off those bite blocks/turbos (blue things) on my back molars which were put on to prevent me from biting down on the brackets. I no longer bite down on the brackets, so I wanted them off that way my mouth can better bite down evenly. As far as timeframe goes, it’s hard to say. My goal is still to switch to Invisalign by February (the latest; hopefully sooner), but it’s really contingent on how fast my crossbite can fix itself. I’ll update this post next week (by 10/25) once I see the ortho and have a better idea of things. UPDATE 10/25: Appliance was not ready yet. They added blue spacers between my back molars to ensure an easy application once the appliance is ready. Hoping to have it ‘installed’ next week. I’ll update again by 11/4. I feel like I’m hitting the home stretch SOOOON, everyone (home stretch, as in, switching to Invisalign, haha)! 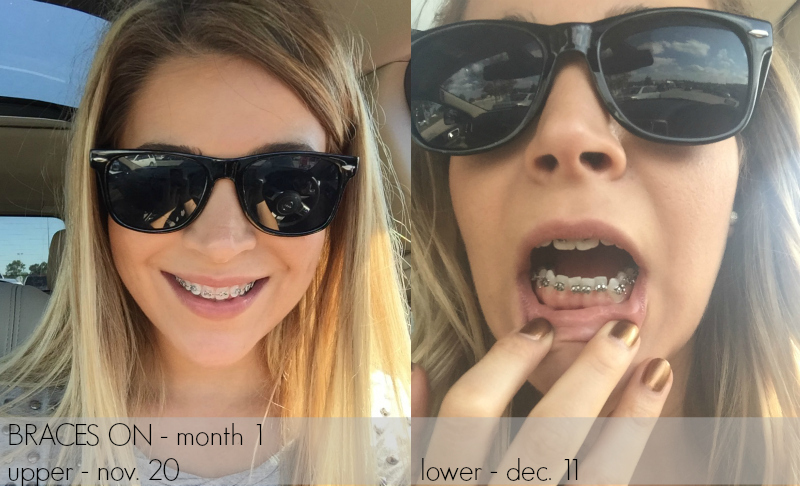 I’m feeling way better about my braces lately. I hope you are, too. And if you’re not, know it gets better. "A Bunch of New Beauty Items…"